Famous kabuki actors enjoyed playing the colourful roles of itinerant vendors. 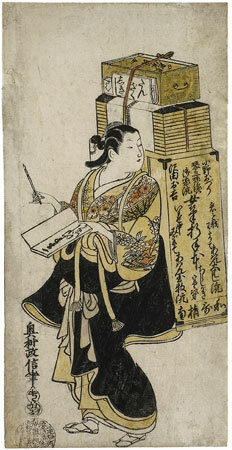 Masanobu’s vendor sells paper for poems (shikishi and tanzaku), along with books and instructional material on waka poetry and koto playing, as is indicated by the label on her carrying crate. At the top of the crate is a box of books, including Genji-monogatari. In her hand she is holding a calligraphic copybook (tehon) and a brush. A woman trader in books, poetry slips and music scores offers her goods for sale. She carries a huge wooden box on her back. Strapped together on top of the box are: a case of books containing the Genji-monogatari, as well as a bundle of poem slips (tanzaku) and coloured paper. The four letters on the lower side of the wicker basket waka-shinan („A guide to writing waka poetry“), and three titles of works from different schools indicate the aim of her business. In addition to poetry slips she also sells literature for instruction in waka poetry writing. In the 17th c. and 18th c. such travelling saleswomen were the chief purveyors of literary products on the streets. In her hands she holds a calligraphy book (tehon) and a brush. Her robe is decorated with hats filled with cherry blossoms. She stands against a completely empty background. At least two unsigned copies of this woodblock are extant. One originally belonged to the Tony Strauss-Negbaur Collection and was discussed by Fritz Rumpf in the auction catalogue of the collection (1928). He also mentioned the existence of an identical but later leaf signed by Masanobu. A further impression of this woodblock, also unsigned, is owned by the Tokyo National Museum. These two leaves exhibit a different colouring. The uchikake, which is let down, is decorated with large lettering, hidden in our leaf by the black colour of the urushi. The later version of the print, in which the hairstyle of the woman conforms to the fashion of 1740, is reproduced by Rumpf. Great numbers of street tradesmen and tradeswomen enlivened the street scenes of Edo. They traded in innumerable wares such as flowers, fans, combs, and hair decoration ornaments, tooth powder, wigs, fukusa (textile gift wrappers), and even votive tablets and ukiyo-e woodblock prints. Famous Kabuki actors liked to appear in such picturesque roles. In the woodblocks of early ukiyo-e they seem to have been especially popular between 1720 and 1745.